Californian based Rishi Karim Gargour a.k.a. 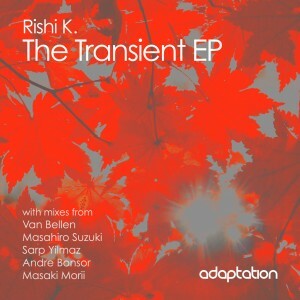 Rishi K. is a prolific and consistent producer and delivers a fine two tracker for the 29th release on Adaptation Music. Both ‘Transient Day’ and ‘Soul Explorer’ are fine tracks in their own right and are backed up by some stunning reworks by Van Bellen, Sarp Yilmaz, Masahiro Suzuki, Masaki Morii and Andre Bonsor.